GTL - transponder key, shell & remote parts manufacturer. GTL - GLOBAL TECSPRO is a aftermarket transponder key, shell and remote parts manufacturer founded from Taiwan, now located in Guangdong, China. 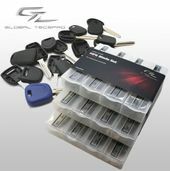 GTL's products including key blades, transponder keys, transponders, remotes, shell replacements, emergency keys, Multi Function Key, locksmith tools, car security simulators, etc. They currently have customers from 60 countries all over the world.